This past weekend was busy. Full of family, fun, love and good food. We had Lucille's baptism on Saturday, which is a pretty big party for Greeks even when you try and keep it small. Well, to make my Saturday busier, I went to an awesome Talk, Taste and Tour event at the California Pizza Kitchen in Arden Fair Mall. 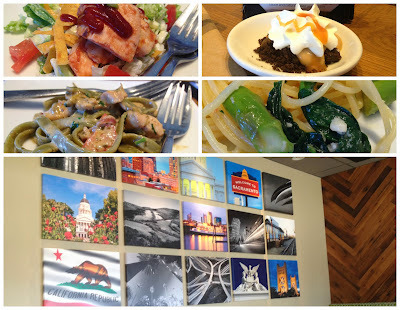 I'm not a huge fan of chain restaurants but I have to say CPK is a favorite, so I was excited to check out the changes to their restaurant and menu. I thought I'd share my experience with my readers, especially the local ones. All the wood in the restaurant is reclaimed from barns and railroad box cars. which is pretty neat. The new additions to their menu include new cocktails, wine on tap and new menu items. We tried two appetizers, two pastas, two salads, one pizza and two desserts. The winner for me was easily the Salted Caramel Pudding (top right corner of the collage.) It was amazing. I don't even remember what the second dessert they served us was because the first was so good. Some of the other yummy things pictured above that we tried: BBQ Chicken Chopped Salad, Chicken Tequila Fettuccine and the Asparagus and Spinach Spaghetti. Everything was delicious.